It feels so good to laze around and enjoy the sun with a good book for company! It's been ages since I wanted to share my mega literary “crush” with you. Three years to be precise. But since I didn't know how I could do that without risking any spoiler, I guess I was waiting for the right time and most especially for the next instalments to come out, just to make sure I wasn't going to be disappointed. And I'm not. I'm over-thrilled by this new series for « young adults » as never before since Harry Potter, and I would go so far as to say that it's absolutely not second to the latter. Still, comparing both would not only be simplistic but totally irrelevant since, unlike in J.K. Rowling's work, the hybrid world Christelle Dabos created is pure fantasy (with an added touch of steampunk1) and doesn't expand into our own reality. 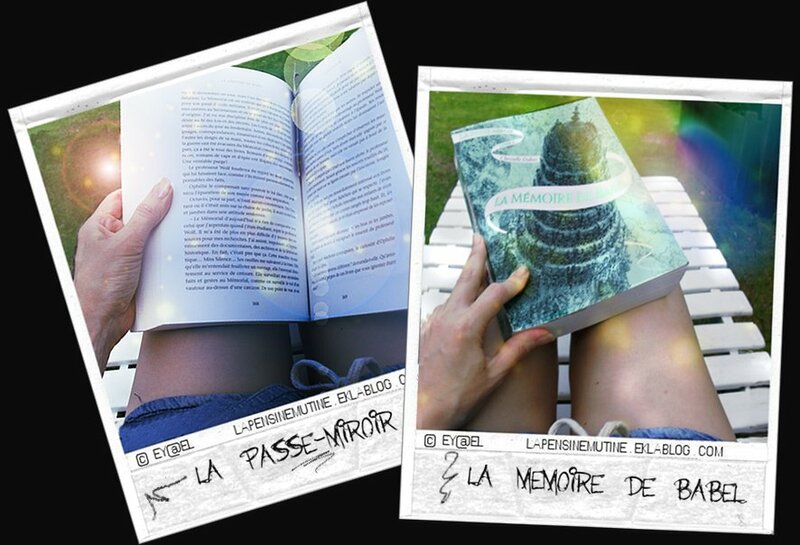 So The Mirror Visitor is a four-book French series (the third one having just hit the shelves about two months ago), written by a young lady based in Belgium and winner of the Gallimard Jeunesse-RTL-Télérama First Novel Competition in 2012. In the first instalment, we're introduced to a world shattered by a disaster and ripped apart into arks of land suspended in mid-air. Each ark is ruled by an immortal being with a failing memory (there is a good reason to that as we'll find out later on) called Family Spirit who actually is the ancestor of its inhabitants, all gifted with supernatural powers. So Ophelia lives on Anima, an ark where objets have a life of their own. A clumsy, poorly-dressed loner who wears glasses like Harry, but any comparison ends here. Ophelia is a young adult who can read things — which means that, by merely touching objets she's able to recall their past and the thoughts of each person who came into their possession. But she's also got a secret unusual talent: the ability to pass through mirrors as if they were some kind of Portkeys2. She's been enjoying a quiet life in a large, lively family (a bit like Tolkien's Hobbits) until, for political reasons, the Deans decided to force her into a marriage of convenience to an influential man from the Pole, which she cannot decline (again) without risking to be banned both by her family and peers and from her native ark. So, along with her aunt Roseline who chaperons her, she leaves for the Citacielle (literally the Citasky) to meet her fiancé who is as cold and cheerless as an iceberg and actually doesn't seem anymore pleased to have her around than she is. There, she encounters a much different world and a decadent society where rival clans shamelessly compete in depravity, violence, murder and corruption. Not to mention the boudoir conspiracies where the favourites are battling to gain the attention of the great Farouk — all somewhat reminiscent of the court of Louis XIV and Alexandre Dumas's books. Ophelia is promoted to vice-storyteller of the great Farouk and in turn becomes the target of hatred and brewing conspiracies running under the cover of the golden ceiling of the Citasky. She unwittingly gets involved in a trail of events beyond understanding where she plays a keyrole. I'm aware that this is a lame attempt to summarise (without spoiling) a storyline much more complex including many twists and turns without any downtime in between. More than two and a half years have passed since the latest developments. Ophelia uses a fake identity to move to Babel, a cosmopolitan ark on the leading edge, which the author further describes as “a crossover between India, Reunion Island, [...] and the Hanging Gardens of Ancient Babylon.” This new instalment leads us directly from a Dumasian/Pullmanian atmosphere to a full Orwellian dystopia quite reminiscent of Farenheit 451. Ophelia finds herself joining a prestigious college seemingly ruled by the law of bullying, elitism, betrayal and backstabbing. With an unpredictable storyline still as compelling and tightly plotted as ever and never running out of momentum Christelle Dabos surprises us by treading off the beaten tracks of fantasy, providing a clever creative mix of genres while challenging all its codes and clichés. Her neologisms are even a match for those of her British predecessor J.K. Rowling. Her Trambirds and Upsidedown Lounges, for instance, are pure delight for our imagination and well worth all the Hourglasses in the world. My mother would have none of this. She keeps going and claims what happened to ***, ***, and ** is nothing more than a series of accidents. She dismisses ***'s testimony as pure nonsense. Her ill-will is so strong I nearly thought that she's... well, it's terrible to say... that she's withholding information. For me, worst is that she genuinely believes in her own assertions. She's so obsessed with the idea that our city is perfect that she cannot simply conceive it to be any different. Now, it's going to be another year at least until we can read the next and final instalment. In the meantime, the good news is that since the first two books sold more than 130,000 copies each, the series will be translated in several languages such as English, Italian and Spanish. For more information, you may visit the official website of la Passe-miroir (in French). UPDATE: A dedicated site to The Mirror Visitor Quartet is now available in English HERE. ^ In the Harry Potter series, any object can be used as a Portkey and be set to transport anybody who touches it to a designated location or to become active at a predetermined time and transport itself and anyone touching to its set destination.